Feeling under the weather? Well, as awful as it may be to catch a cold or the seasonal flu, don’t let it get you all worried. You can actually turn things around for you by giving your body the much needed health boost. Yes, it’s not without reason that people say how important a role a good diet plays in our lives. With a handful of nourishing ingredients, you can boost up your immunity and help your body fight against infections. And probably the best way to do that is to make yourself soul nourishing soups. Most people cringe at the thought of soups because they think it is bland, boring and way too healthy for one’s liking. The truth is that soups can be made in so many delicious ways, using your favourite ingredients, that you will actually look for excuses to dig into soups as often as you can. If you love veggies, you can add in seasonal favourites like carrots, peas, beetroot, spring onion and sweet potato among others. Meat lovers can include chicken, pork and even mutton bones to notch up the flavour. Then there are spices and herbs that can be added to transform the mix into a delightful dish. For some indulgence, you can stir in grated cheese and cream. Really, there are plenty of options. Mushrooms are loaded with vitamins and antioxidants, such as selenium, which is known to help support the immune system and prevent oxidative stress. Turmeric, on the other hand, is known for its healing and immunity boosting properties. Method: Heat oil in a pan and fry the onions, garlic and mushrooms for 10 minutes. Add turmeric and seasonings and add 3 cups water. Let it simmer for 30 minutes and then add the greens. Simmer for 10 more minutes and serve warm. Bone broths are known as a health tonic since the ancient times because it is packed with nutrients. It’s time consuming to make but the slow cooking causes the various vital minerals, amino acids and collagen to get extracted from the bones, thus making it great for boosting immunity. Method: In a heavy bottomed pot, heat oil and then saute the onion, garlic, ginger and carrots for 10 minutes. Add the mutton bones, pepper and salt and cook for 5 minutes before adding 4 cups water. Simmer for 1 hour 30 minutes or you can even pressure cook it for 5 whistles and then let it simmer for 30 minutes. Finish with butter and serve. Chicken soup for the soul? Yes, that’s what this is. With the goodness of ginger and other seasonal veggies, you are sure to instantly feel good. Method: Melt the butter in a saucepan and fry all the veggies and chicken strips. Add the stock and seasoning and let it simmer for 15 minutes. Finish with fresh coriander and serve. 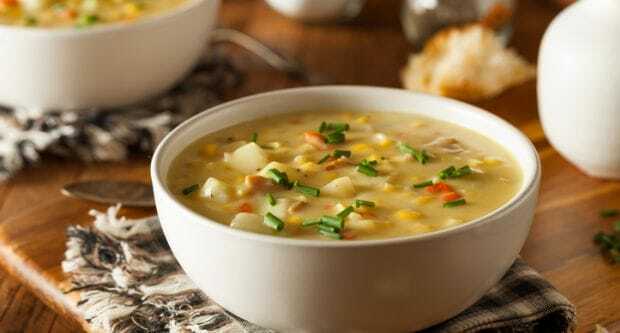 Relish these flavourful soups and chase away the blues.